I love seeing old films that center around D.C. I also love finding films that have been forgotten. 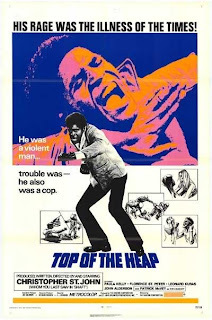 Top of the Heap is one of a kind film. It's not Blaxploitation so it hardly ever made it on the list of Black Films. The plot is simple. A cop is stressed out with his duties as a cop. He finds doom and misery on a daily basis so he creates his own world. A world where he could be and do anything. An astronaut for one. The astronaut sequences were filmed on the Mall and on the very spot of the now Air and Space Museum. Paula Kelly also stars and she is excellent. Of course the film will have some Washingtonians saying, " Hey, there are no palm trees or huge drainage ditches in D.C.!"